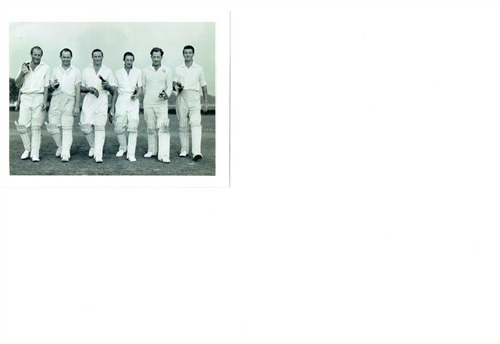 Kirdford Cricket Club originated in 1889 playing at the present football ground. After the War cricket was played on the Recreation Ground (which was donated to the village by Sir Peter Mursell) but their dressing room consisted of a wooden shed, part of which housed the gang-mowers. The only water supply was from a tap on the outskirts of the ground. The only way to boil a kettle for the teas (which the ladies made at home and brought to the field) was a primus stove. In spite of this, when London teams came for an all-day match, cold salad lunches were provided. As the team improved it was decided to join the Club Cricket Conference, enabling the team to get fixtures, both home and away with several London teams – Carnorba and Albion being very popular fixtures. By this time, the Club was in a position to run two teams. Also, during all this – funds were being raised to build a pavilion. One of the highlights of the cricketer’s year was Ebernoe Horn Fair; held on July 25th, Ebernoe C.C. play a local club. During the match a horned sheep is roasted and at the end of the match the horns are presented to the player with the most runs on the winning side. This fair still continues. For several years the first eleven spent a weekend in Suffolk playing at Framlingham and Saxmundham. Annual six-a-side cricket tournament was organized by Cranleigh Cricket Club. Matches were played over several evenings and proved to be very enjoyable. Finally, the long awaited Pavilion was built, making life more pleasant for all the different sportsmen and women using the Ground. Kirdford Sports and Social Club was formed, uniting the football, stoolball, cricket and tennis clubs. An End of an Era hppened back in May, 2015 when Harold Peacock, the last of the Peacock brothers died. The older generation in families in the area will probably remember coming up against these boys in cricket, football, darts, bar billiards and later bowls matches. Always out to win whatever the game. Many a football referee will remember the name of PEACOCK and probably the inital that went before!!! In August 2014 and 2015 cricket matches were played between relatives of the Peacock family v Kirdford men and men who had been involved with the boys. Money raised from these matches made it possible to buy a bench "In memory of the Peacock Brothers" and give donations to Kirdford Recreation Ground Management Committee, Kirdford Toddler Group and Kirdford Parish Council towards new play equipment in the village.